Audi says it will meet its target of delivering 30,000 A1 models this year. MUNICH -- Audi denied suggestions that its new A1 entry-premium car is losing sales because it is priced too high. Audi dealers and industry observers believe the A1 is failing to attract an expected rush of customers because it costs too much for its target group of young people, according to Automobilwoche, a sister publication of Automotive News Europe. The A1's starting price is 15,800 euros ($20,873) in Germany. An Audi spokesman said: "The A1 is enjoying considerable success: The company stands by the estimate made at the time of the car's launch that around 50,000 units will be built by the end of 2010 and 30,000 of them delivered to customers." Audi developed the A1 as a competitor to BMW's Mini and has installed annual capacity to build 100,000 A1s at its factory near Brussels in Belgium. ''Audi is simply asking too much money for a small premium car,'' Metzler Bank auto analyst Juergen Pieper told Automobilwoche. He said Mini could charge high prices for its models because the brand has a cult status. 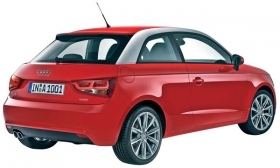 Some German dealers believe Audi has priced the A1 far too high for the the young target group at which it's aimed. ''For them it is simply too expensive'' a German Audi dealer told Automobilwoche. Audi has sold 20,000 A1s since the hatchback was launched in late August, Automobilwoche said. The Audi spokesman said every A1 built is associated with a customer order, the same as applies to all Audi cars. "The Audi A1 is a premium car for mobility in cities. It is therefore a product aimed at a very wide target group," the spokesman added. Automobilwoche said, citing dealer sources, that Audi plans to boost sales of the A1, which is currently only offered as a three-door model, by bringing forward the launch of a five-door variant to next year instead of 2012. Audi developed the A1 for European buyers. The company has said it may sell the second-generation A1 in the United States.